Well last Sunday we received around 4” of rain in a 24 hour period half of which came overnight. I happened to want to get something out of my shop on Monday morning and opened the basement only to be hit with the smell of “wet basement”. I quickly looked around and found some puddles and seepage around the whole basement but not a lof standing water. After coming home from work early I was able to better assess the damage, it seems my sump pump switch failed and the narrow french drain backed up allowing water to seep all around. The fans and dehumdifier ran for three days straight and it seems all is better, though still trying to bring my humidity level back down. Have a feeling that will take a while. Now the good part, most that was lost was trash I had in the basement and it sucked up a lot of the water to minimize damage. I did lose a pretty good size roll of leftover carpet that I had hoped to use in the ongoing basement finishing but oh well. All my tools were off the floor and safe. I spent all day Tuesday and a few evenings down there cleaning up and working on some projects that I had been wanting to deal with. 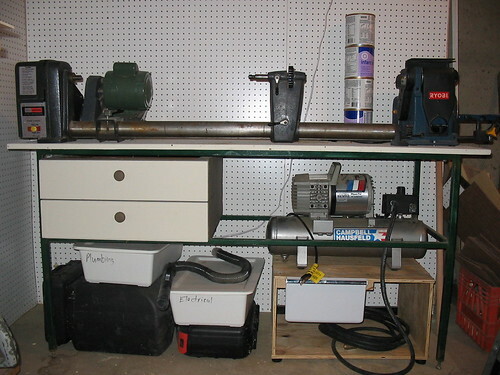 My Lathe table is now in the basement and only needs some fine tuning. I painted it and made some sedits to it. There is enough room on the end of the table to mount an additional tool, at this time I went with my bench sander and that may be the winner. Though a sharpening system may be in the future so we will have to see. I was able to fit my compressor under the new table to get it out of the way and added a drawer to it for all of the misc. parts I have for it. Yes that is a fridge drawer in case you are wondering. We tossed an old fridge that died a few months ago and I salvaged the drawers, which I could of kept more of it out the ladfill but.. I was also able to add a new curtain wall to cover my storage shelves. I am hoping this should help to minimize the dust some on my Christmas decor and other storage stuff. I made 4 individual rods and “kregged” blocks of wood with closet rod hangers to the uprights of each shelf. 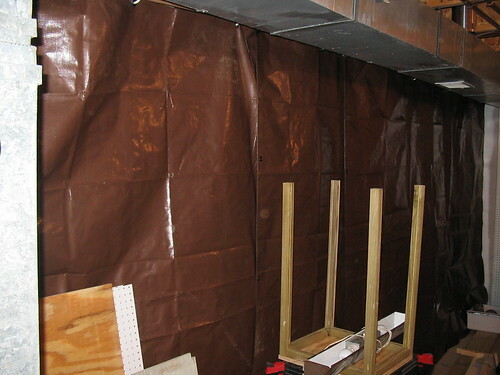 The tarps are overlapped to provided maximum protection. Oh yeah I also bought and installed a new sump pump so I am hoping that is the last wet basement I see. Catch up to everyone soon. Congrats on both the progress you are making on your shop and that the water damage was so limited. It could have been a lot worse as I am sure you are aware. I am glad that you did not have any real damage. Hey Chris, Wow…sounds like you dodged the bullet on that one. We had the same storm and a few of our neighbors had the same problem. Be sure and keep a coat of wax on your tools for a while to help avoid rust. With all the humidity the past few weeks, I’ve had a few that started to get some surface rust. It sounds like you got the rain that passed through the midwest earlier in the week. I know that you must have had a job on your hands keeping things dry. We had lots of flooded basements here in the St.Louis area too. 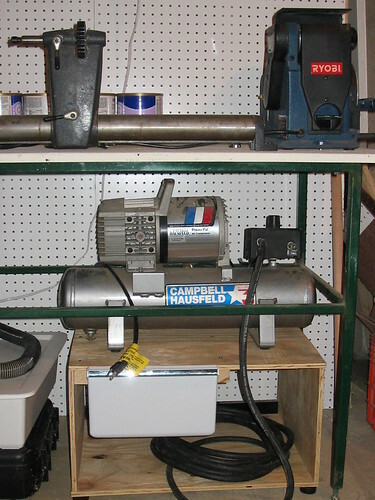 Have you thought of purchasing a DEHUMIDIFIER for your workshop? I believe there’s quite a few of them being sold & used around our area now. 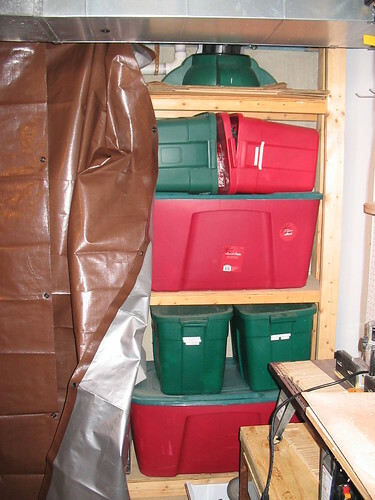 Running a dehumidifier is also good at stabilizing wood that’s stored in the shop. Good luck on keeping the sawdust off the shelves. Putting the plastic curtain will help a lot. My shop is crammed into my two car garage & every so often I have to open the garage door & use my leaf blower to dust things off.